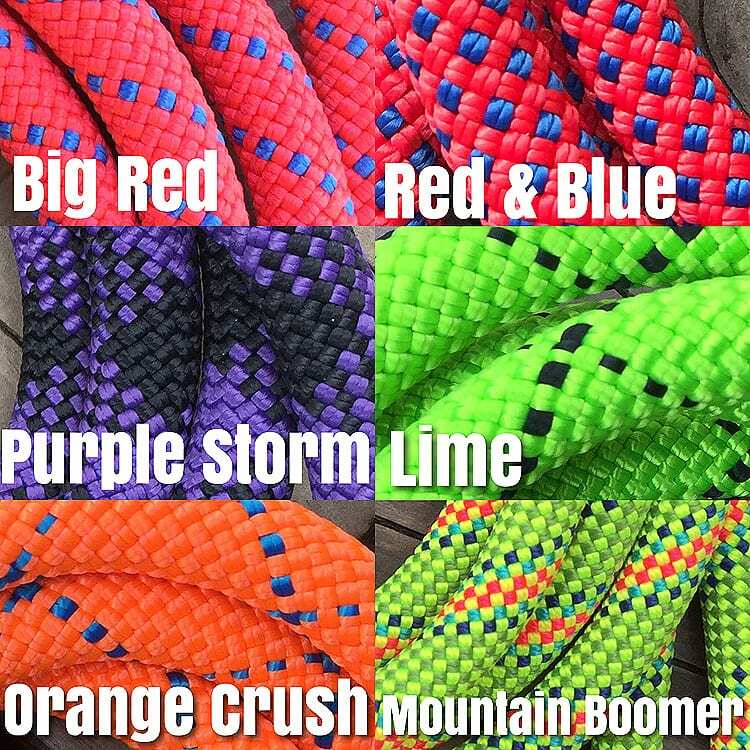 Climbing Rope Dog Leashes Handmade in USA. 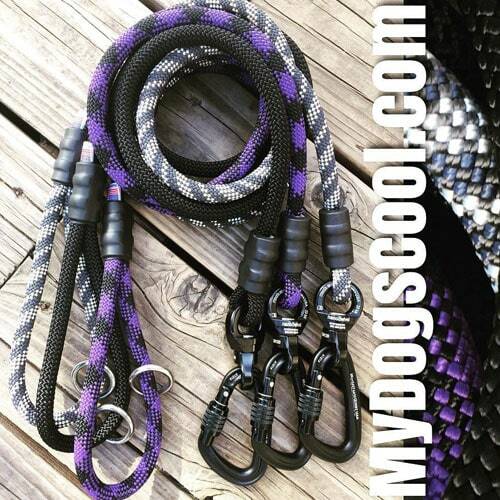 Ultra Violet Climbing Rope Dog Leash handmade in U.S.A. using 10.5mm mountain climbing rope, marine grade 316 stainless steel clips, and customized seamless rope connections. A dog leash is a simple design often taken for granted. A dogs leash is it’s lifeline between you, and harms way. This is our attitude when building custom climbing rope dog leashes. 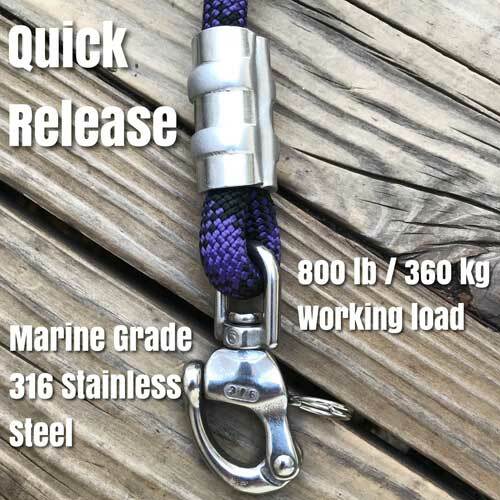 Quality materials, genuine climbing rope, heavy duty 316 stainless steel clips, real carabiners, and cnc machined nanoswivels are not simple components. These are quality parts thoroughly tested by its manufacturer to meet certain strength, and quality control test not required by manufacturers that mass produce typical store bought dog leashes. Most medium to extra large dogs have the muscle, power, and determination to break a low quality leash. Not all dogs realize this. It’s only when a combination of events, all come into play that we discover our big dog in chase of that pesky squirrel, and leave us behind holding a broken leash. There are numerous scenarios that can lead to broken or damaged leashes. Not everyone has that perfectly trained dog that walks like a pro on leash. Some of us have rescue dogs with various issues that cause them to become unpredictable around loud sounds, cars, other dogs etc.. It’s only smart to have a well made leash to help maintain control while training your rescue dog. 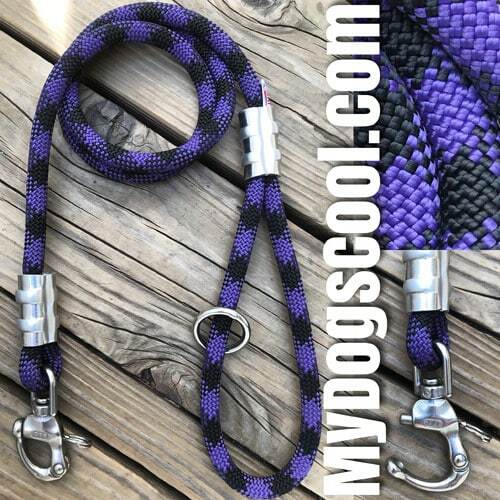 Dogs deserve the best, we think you will find our dog leashes are among the best made in USA.The Ultra Violet Climbing Rope Dog Leash is a Limited Edition. We think it will be a popular choice, and help with our efforts to raise funds for local no kill shelters. To learn more about the hardware used in building your leash, please read The Best Dog Leash. Thanks for your interest in our custom dog leashes! 4ft Walking Leash built with 10.2mm Climbing Rope and Stainless Steel Clip. To customize this leash select options from the drop down menus. Select the style of Clip for your Custom Dog Leash. 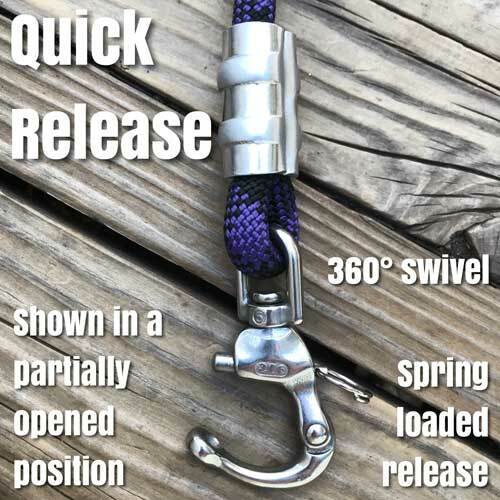 The optional second Loop Handle or Power Grip is built at the dogs end of the leash. This is great for crossing streets or when added control of your dog is needed. 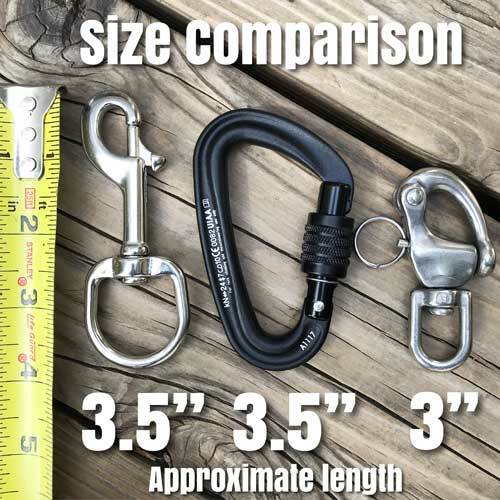 • Carabiner: High-Strength Aluminum, Compact Design, Screw Gate Lock, Strength 24kN, Length 3.5 inch/89mm, Weight 1.53 oz. • Handle Inner diameter: Aprox. 6.5″ to 7″ L x 3.5″ to 4″ W.
• Rope Material: Multi-Stranded Nylon/Polymer Fibers. Meets UIAA standards. • Snap Hook Material: 3.5 inch/89mm – Marine Grade 316 Stainless Steel. 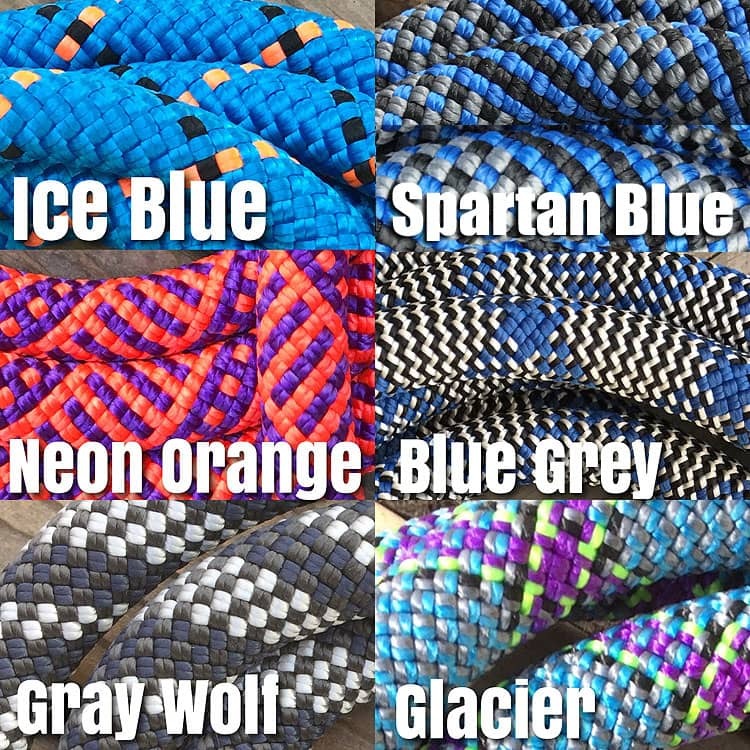 Rope Dog Leash Buyers Guide with Tips and Suggestions.